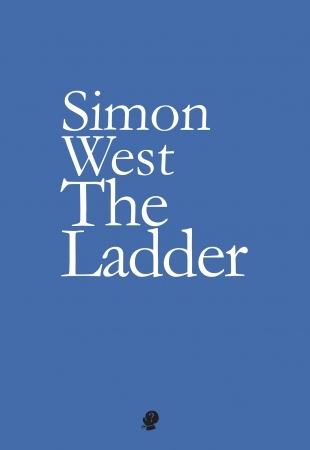 In his third collection, The Ladder, Simon West presents a series of poems with the tensile strength of filigree and flower stems, split seconds where meaning occurs as a wavelet suspended above the mosaic particles that make up a beach. After my first reading, I feel sure that I have also felt sunlight glancing off the skin of a grape, tendrils curling around a wooden table leg, sunlight, wine and citrus. Meanwhile from back at the frontispiece, falls the delicate adumbration of half distinct colour from the ‘eyes turned to beautiful eyes’. Left in the original Italian, these lines from Dante’s Paradiso guide the reader into a seamless world of in-between spaces, the copses, courtyards and open chambers of seemingly chanced upon civilisations. It appears an apt avenue to announce a voice that imagines and recollects patches of Paradise, archaic vistas and the fragmented annals of Antiquity. Its flow moves not only from the hills to the harbour – tracing the old masters – but creates an interchange of song and recollection between Italy and the Antipodes. The opening poem, ‘Roman Bridges’, surveys the ground on which the poet takes his stance, contingent on ‘good footing’ and how effectively the points of contact between solidity and ephemerality hold. He states with quiet and deceptive simplicity: ‘My ideal landscape has room for bridges and hills, / spires, birds and echoes: halfway things’, and simultaneously evokes the azure light in the spaces around objects in fine art of a similar sensibility. Visually, the old masters coexist with Romantics in dimensions of a space where dreams can develop, reflected in the water’s existence, ‘flowing on’ beneath, and filtered through the webs and threads of language. Layers of space and the interweaving of micro with macrocosmic size feature throughout the collection. Lines create spans across languages and cultures, darting in and around sounds and images with a playfulness tempered by awareness of age. There is a sense of correspondence, from the ‘dancing tips of a tree’ to a world that is ‘tangible’ and a wish that its phenomena ‘be carefree still’. This in turn recalls and creates a meeting point with the presence of the wilderness poet Du Fu in this garden of poetic delights as a reminder of its transience and the ‘trepidation’ that attends the enterprise of a poet’s craft. The ancients shadow reflections on time ‘round the threshold which the senses keep’ while ‘outside there is so much to contemplate’. as if looking out were a way of looking in? This spirit of enquiry is conveyed by the same conversational and candid voice in which gods and familial presences alike are addressed with an equal measure of respectful consideration and the informality employed among equals. It also offsets without attempting to conceal the parallel presence of dark and stranger undertones. Given this open mindedness, it is hardly surprising that the subconscious is also given its due. Rivers as brown snakes in which ‘hands immersed were lost’, ‘shadows under tress at night; and dreams / of falling down a gyre’ are some of the darker archetypal images that course beneath the sunlit surfaces. They serve as reminders, that for all the immanence of ‘golden words’ and new forms of life, there is also a heretic burning as ‘townsmen glow in the heat.’ To look again closely at each poem is to discover another image rising from primordial depths to take it its place alongside those more immediately visible on the planes and surfaces where these fragments of lives and their components are crystallised and composed. The presence of the titular ladder is not immediately obvious, and it takes attentive reading to locate it in the second stanza of ‘The Taking Up Of Earthly Pursuits’, after leaving Du Fu and Apollo. It works as a beautifully simple metaphor for steps taken through a life where ‘each of us / must be put to the test of likening.’ The inconsistency of memory co-exists with the uncertain spaces between the rungs of life’s stages. The poet sees himself climbing up and down, a path that is neither linear nor circular, and not so much Sisyphean as Dantesque. A ladder, like a bridge, creates a halfway space between a solid structure, the earth and the open air. Elsewhere in the same poem, he is given the ocean to swim in before digging ‘the roots / of seedlings into pots’, creating another evocation of the watery threshing floor and the dark, enclosed flowerbed. Lines from Paradise come so far, for beauty, vocation and traces of the anxiety that attends all sentient beings. This entry was posted in BOOK REVIEWS and tagged Nathanael Pree, Simon West. Bookmark the permalink.